Pictured are Roman Lopez (dad), R.J. Lopez, Tony Lopez (brother) and Terrie Lopez (mom). The T-shirts were designed and kindly sponsored by BesTees’. Pleasanton Elementary student R.J. Lopez attended the Envision National Youth Leadership Forum: Pathways to Stem at the University of Houston. Now a fifth grader, he was nominated for this honor while in fourth grade. 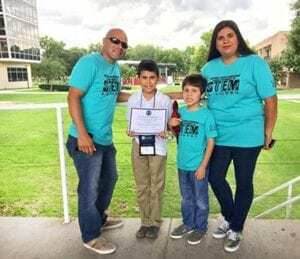 With months of earning and fundraising with family and friends, combined community support, sponsors and donors he was able to reach his goal and attend the program in Houston from July 7-12. There he had an amazing experience meeting peers from many different states who had similar interests and goals and became friends. The scholars learned and worked on leadership, team building, communication, collaboration and public speaking skills and were given daily timed stem challenges to complete as a team. Learning and exploring about medicine hands on was exciting. Diagnosing and treating injuries, learning and diagnosing snake bite differences, how to tell malnutrition versus heat exhaustion. R.J. also worked with his team in dissecting a real beef heart while learning in depth about the cardio vascular system. Engineering introduction and learning to build Mbots and Bristlebots, programming and testing them as well as racing them against other bots as a challenge was fun then learning to deconstruct them. Some components of Robotics were taught as well and RJ enjoyed it as he hopes to be a Robotics Engineer. CSI- Forensic Chemist/ Scientist was also interesting as they created a hypothesis regarding a Criminal Scene Investigation case and compiled evidence with blood drop replication and analysis, pulling finger prints to try and solve their case and see if they were correct or not when presenting in front of all the parents and family on the last day. With this very challenging, independent and fast paced program they also made sure the scholars were able to enjoy arts, crafts, games daily. R. J. received his Certificate of Achievement and is excited that now as a scholar he is able to attend any Envision programs from here on out. He enjoyed this program and learned many things and has grown. We are very appreciative to each person who encouraged him and helped him in any way to make it to NYLF: Pathways to STEM.